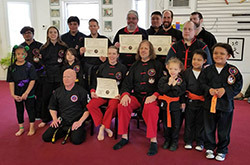 What Does It Really Mean to Be a Black Belt? We will be closed on Saturday March 31st. Have a great Easter! The tournament is location will be in Milwaukee; exact place to be announced. Get your application from any of these schools today. 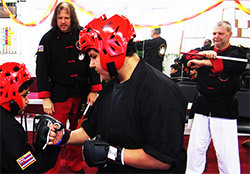 In honor of our upcoming tournament Rising Dragon is offering a special 20% off on sparring equipment package: New Helmet (Silver, Red or Black), Cobra Sparring Gloves, Mouth Guard and Case: only $55. Rising Dragon Training Carry Bags to keep your equipment in are also 20% off at $25 a bag. Colors include black, red, blue and green. April each student can bring one friend and family member for a free week of classes ($20 value)! Testing will be on Friday April 27 at 5 p.m. An Awards Ceremony for all to watch will be at 6. Higher level testing will begin earlier that day – be sure to consult your test invitation. Rising Dragon is now posting all of its training DVD’s on an internet site – so when you purchase a ‘Block of Training’ for Kung Fu and Kenpo, Tai Chi, Kickboxing instead of a clunky out of date DVD you now will be given access to the site for the videos on the web. You will have access anywhere, anytime with any mobile device or computer! Those who have previously bought DVDs should see Sigung and he will hook you up for video access of what you purchased! White Lotus Tournament – Saturday June 16 8 a.m.